SOLO – It was not just a contest between two different men, but between two different ideas of how the world’s third biggest democracy should be run. Indonesia’s 2014 Presidential election pitted Joko Widodo, or “Jokowi” – the wispy, gregarious former businessman, against Prabowo Subianto, a former soldier who married one of ex dictator Suharto’s daughters. The former a product of Indonesia’s post-Suharto democratization, the latter suggesting he wanted to take Indonesia back to Suharto-style autocracy. Jokowi began the campaign as clear favorite, but a mix of vacillation by the Indonesian Democratic Party of Struggle (PDIP), the party which nominated Jokowi for the Presidency and which won the biggest number of seats in April’s parliament elections, as well as some some vague messaging by Jokowi himself, allowed Prabowo catch up in the weeks before the July vote. The eventual loser’s terse bluffness, from which some voters inferred decisiveness and strength, was abetted by dirty campaigning. Prabowo alleged that Jokowi – a Javanese Muslim – was in fact a Christian of Chinese descent, and therefore not fit to lead the world’s biggest Muslim populated country. Jokowi nearly blew a double digit poll lead, but in the end Indonesia elected its first head of government from outside the old political and military elites. Nearly 200 million voters in a trillion dollar economy, albeit one riddled with graft and red tape, opted for a gentle-sounding reformist ex-entrepreneur over a horse-riding oligarch who came across as part Hugo Chavez, part Vladimir Putin. Prabowo, a former Special Forces head who was dismissed from the army after 13 democracy activists disappeared under his watch in 1998, drew strong support from middle class and urban Indonesians, going by surveys – as well winning votes from the majority of political parties who backed his candidacy. “Prabowo’s ability to attract almost half the population with a populist and ultranationalist agenda suggests that Indonesian democracy needs further strengthening—a task that will now fall to Jokowi,” wrote academic Marcus Mietzner. 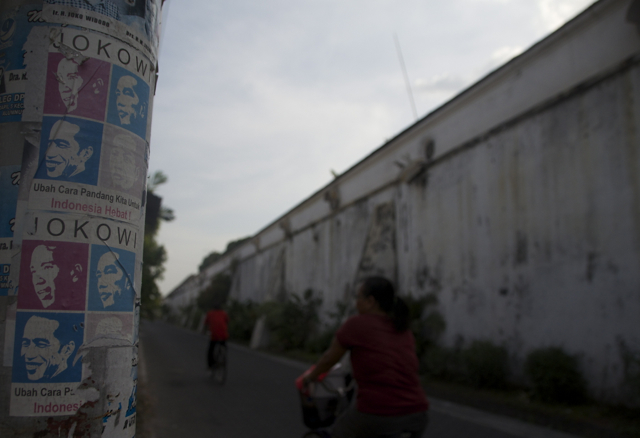 Jokowi made his mark in politics while mayor of Solo, his home town in central Java. The new president is fondly remembered for his seven year tenure, during which he won re-election with an astonishing 90 per cent of the vote and earned a reputation for shunning the bagi-bagi or spoil-sharing habits of other politicians. “He didn’t do any money politics, not like the others” said Asti Suryo, the assistant manager of the Danar Hadi museum on Solo’s main street – a thoroughfare which Jokowi famously cleaned up while mayor. But even before Jokowi took office as president, Indonesian democracy was dealt a blow when MPs allied to Prabowo – who needed an August constitutional court ruling to tell him he had lost the election – voted to end Indonesia’s system of directly electing heads of local government – the same format that enabled Jokowi get his start in politics in Solo back in 2005. 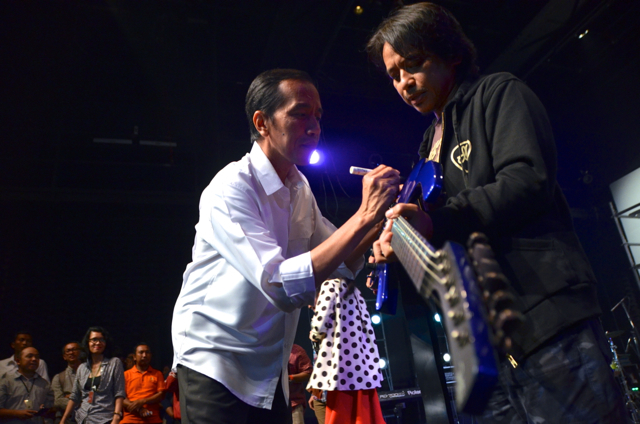 “If there wasn’t any direct election, he [Jokowi] would still be selling furniture,” Asti Suryo told The Edge Review. Former President Susilo Bambang Yudhoyono – perhaps embarrassed at the public outcry against his Democratic Party’s allowing the vote to pass – later blocked the change. The new parliament will vote again on whether to ditch the direct local elections system, with the opposition’s quest to have heads of local government getting a boost on December 3 with the re-election of Aburizal Bakrie to the helm of Golkar, the biggest party in Prabowo’s coalition. “The implementation of direct regional elections depends on how other parties’ position in the voting, especially Democrat party,” said Adhi Priamarizki, an Indonesian politics analyst at Singapore’s Nanyang Technological University. Whether or not the local elections system is finally vetoed will depend on other parties inside Prabowo’s coalition. “Golkar may reject, but the party alone will not enough to gain the majority number in the parliament,” Adhi told The Edge Review. Either way, Prabowo has signalled to Jokowi that he can undermine the new president and, by extension, the wishes of Indonesia’s voters. Jokowi has already implemented the first significant reform of his presidency – upping fuel prices by around 30 per cent in an attempt to liberate cash for much-needed infrastructure spending. “He is on the right track, though many people have high hopes of him,” said Bonar Tigor Naisposos of the Setara Institute, a Jakarta research organization. But that does not mean the new president has yet met the heady expectations of the thousands of young volunteers who helped get the vote out and counter Prabowo’s moneyed media blitz. While Jokowi personifies a new direction for Indonesian politics – a move away from the monied, unaccountable cronyism of yore – he still must contend with not only an embittered opposition, but some formidable vested interests on his own side. Jokowi had to bring people into his cabinet at the behest of his patron Megawati Sukarnoputri, the head of the PDIP and a former President. Among the appointees were Megawati’s daughter Puan Maharani and former army head Ryamizard Ryacudu, the latter breaking a post Suharto convention that the defence portfolio goes to a civilian. What 2014 has shown, said David Hill, an Indonesia expert at Australia’s Murdoch Universirty, is that Jokowi must contend with “the cold hand of the old elite upon his shoulder” – pressure that will not make Indonesia a more accountable, democratic country. “His ability to reduce the influence of Megawati particularly will be his test,” Hill told The Edge Review.